Villa Yanko is situated in Tucepi, one of the most famous tourist destinations of the Makarska Riviera. This part of Dalmatia is known for its crystalclear sea and for kilometres of beautiful pebble beaches, which are known as to be one of the most beautiful beaches in Croatia. It is close to bigger cities like Split or Makarska, and situated just beneath the mountain range Biokovo, which is popular among those who like to spend active holidays. And the highest peak of this mountain range, called Sveti Jure, is 1762 m high and just a short drive away from Tucepi. Villa Yanko is the perfect starting point to explore some of the natural beauties of that region. And those who are more into sightseeing or night life, will not be disappointed as some of the most beautiful islands of Hvar and Brač are easy to reach from there. After 20 years of attorney in Zagreb, (residence) I bought a cottage in the olive grove in the secluded part of the old uninhabited village. The first goal for me was to rest myself from the stressful work in the metropolis of Zagreb, in nature below the mountain Biokovo with a view towards sea and the islands and enjoying the beautiful sunsets. And so it happened for a few years - from 2011th to 2017th. Enjoying spending time in our oases, Zvonko and me regreted that this beauty of our stay can not be also shown outside of our family and friends ... so we came up with the idea of reconstructing the small cottage in the big Villa with pool and we decided to getting started with the hospitality. Every happy guest and every good review remind us that we just wanted to give our guests a perfect vacation and a perfect enjoyment of stay in pure nature, with all high standards and the comfort of a villa and a spacious heated infinity pool. We have achieved our goal because the guests have recognized it. Thank you all. This beauty of the landscape, beautiful views, specific smells of the Mediterranean, sea, mountains, everything is here in symbiosis. We could not offer guests something we would not like. Swallows go to drink water from our pool several times a day (if you are not in the pool :-)). Squirrel in a tree eat almonds and pearls.. Watch islands, boats on the sea by drinking morning's coffee on the terace and beautiful mountain range of Biokovo behind, you will like it as well as I :-) Only bird singing and the sound of squirrels touch the flow of thoughts. If you also like it you should to come over? In Each bathroom from number 1 to 4 are 2 washbasins, and in 2 of them there are massage shower. Villa is located up in a rural village - hamlet of Tučepi so it is pleasure to stay here on a secluded, without tourist crowd. If you wont to go to town and feel crowd you need 2 minutes with a car. Each room and each space has breathtaking seaview. Islands Brač and Hvar are in front and mountain Biokovo is behind. 360 degrree of beauty. Beach front is 1.500 m away from villa but it is visible from each room. sandy beach, weid, long with clear bleu water surrounded by dense pinewood that makes shadow. Adriatic sea and breathtaking view to the islands Hvar and Brač. Each space has own air condition, with water-air system (not split devices with air-air system). That means quality of the air in the space is much better and guests like it very much. Linens guests might demand each time when guest requests it but staff of Villa Yanko change it at least once after 7 days of stay. Provided with detergents and for guests use only. Wi-fi in the whole property including garden and pool. Each space has smart TV (Netflix, You Tube etc.) For each floor there is one network because of no risk with internet. Beach Towels and bathroom towels (3 peace per guest) are povided. But Guests might demand each time when they need towels... Staff of Villa change it at least once after 7 days of stay. with kitchen (open space) 65 m2, equipped with high standard. Big one with deep frosen part. It makes ice and cold water , guest can manuely make temperature of cold water. Clasical toster for preparing 2 sandwiches in the same time. There are enough dishes - utensils for 3x 10 persons in the kitchen so guests must not wash the dishes by hand . Big massive wood table for ten inside and 2 dining table each for ten guests outside. DVD Player as part of the music line in living room. Villa has children corner for children up to three years old, equipped with small toys and in the garden children's playground from 3 to 12 years - swing for two, rock climbing, sandpit, bench..etc. Each bedrooms has exit to big balcony with breathtaking sea view to islands Brač and Hvar, and to the local beach. If guest has a driving licence, we can rent a boat for him or arange boat trip only for his group or rent a boat with driver. Compfortable seat set for 5 adults with table and 2 big outdoor tables, each for 10 persons for sitting and eating outdoor, one in front of the house and the other is beside the house, BBQ. In Makarska (10 minutes drive) or in Tučepi (5 minutes drive) there are lot of fun and water sports like course of diving, sailing, yahting, fishing etc.. In 5 Minutes drive from villa, guests can play tennis on a public tennis court with teacher (on demand). Table tennis (ping-pong) is in the yard. Villa is equipped with great heated infinity and illuminated swinmingpool surface of 45 m2 (deep 150 cm) plus pool for kids with surface of 14 m2 (deep 30 cm). The property is finished to an exceptionally high standard and owners have thought of everything. The views are stunning and the pool area benefits from sunshine from morning till sunset. The location is quiet, away from the town. It is however, only a few km from the closest supermarkets and there is a fish market and a couple of good butchers. Restaurants in Tucepi and Markarska were good value. The owners were nearby but not intrusive at all. Pool was kept amazingly clean by owner each day before we awoke. Overall a fabulous holiday, we have had villa holidays for years (15 +) and Villa Yanko is the best one so far. We shall consider returning, we have never done this before. Thank you very much for a wonderful review. The guest's opinion motivat us, and it shows us how much we can participate as hosts in the stay of the guests, so that we do not disturb in their privacy. The privacy of our guests is our priority, but our priority is to be helpful too! Sometimes it is difficult to know where is the border between being helpful but not being intrusive. Thank you, we appreciate your opinion! Dear Martin and Emma, and three sons, you were a wonderful guests and every host wants you as a guests. You enjoyed our house and pool as own and left the house after 2 weeks of stay completetly properly and orderly. We are proud to have such a kind guests. I hope you'll come back to visit Villa Yanko again. Villa Yanko is located in a lonely place on the 2000 m2 land so there are no direct neighbors which ensures good unforgetable rest andapsolut privacy. Guests who want to have a good time on the Makarska Riviera will choose our luxury Villa Yanko. The Riviera covers length of 59 km with beautiful pebble beaches above which the mountain range of Biokovo arises. The center of the Riviera is the town Makarska where you can walk all along boardwalks and visit historical monuments such as the 18th century Venetian headwater carved in the coat of arms of the city. If you would like an active vacation, whether it be hiking, cycling or quads, we suggest the Nature Park Biokovo. Sveti Jure, with its 1762 meters height, is the highest peak of Biokovo and in the same time the third highest mountain of Croatia. The Makarska Riviera is a micro-region of a Split-Dalmatia County. The shore, covered with dense pine trees, lies at the foot of Mount Biokovo. The Makarska Riviera covers communities of Brela, Baška Voda, Tučepi, Podgora and Gradac, and as said before, the center of the coast is the town of Makarska. The shore of Makarska was historically divided into 2 parts, Lower and Upper Riviera. The lower part of the coast comprised the villages of Brela, Bast, Baška Voda, Veliko brdo, Makar, Kotišina, Tučepi, Podgora, Drašnice, Igrane and Živogošće. The Upper Riviera included the villages of Drvenik, Zaostrog, Podaca, Brist, Gradac and Baćina. From the 15th to the beginning of the 18th century, the Upper Riviera was called Frag'uštinova named after the founder of the fortress of St. Mary in Zaostrog, monk Fr. Augustin Vlatkovic from the Zaostrogian Monastery. The Makarska Riviera has all the features of the Mediterranean climate: hot and dry summers and mild winters with a large number of rainy days. This year the area has had over 2,700 sunny hours. This info surely guarantees plenty of sunny days in our Villa Yanko. Throughout winter period the annual average sea temperature is higher than 20 ° C, and in the summer it is between 23 and 27 ° C. The Makarska Riviera is one of the warmest parts of Croatia. It is worthwhile to visit the Biokovo Nature Park, just a few minutes away from Villa Yanko, as well as a Malachological Museum located within the Franciscan monastery where you can find a rich collection of shells from around the world. Villa Yanko is located in Tučepi. Guests can relax on the lounger by the pool enjoying private sunbathing, and when they wish to enjoy the beauty of the sea, they can visit one of the beautiful pebble beaches. Guests will surely like the beach and pine forests where they can escape after swimming in the crystal clear sea. It is necesary to having car, bicycle or motor engine but if not there are taxi who transport the guests at a favorable cost of transportation. Villa Yanko is far away from Tučepi 1.4 km and from Makarska 4.8 km. The luxurious modern style villa surrounded by rural ambience offers enjoyment in nature perfectly blended with the space ambience of top architectural design. 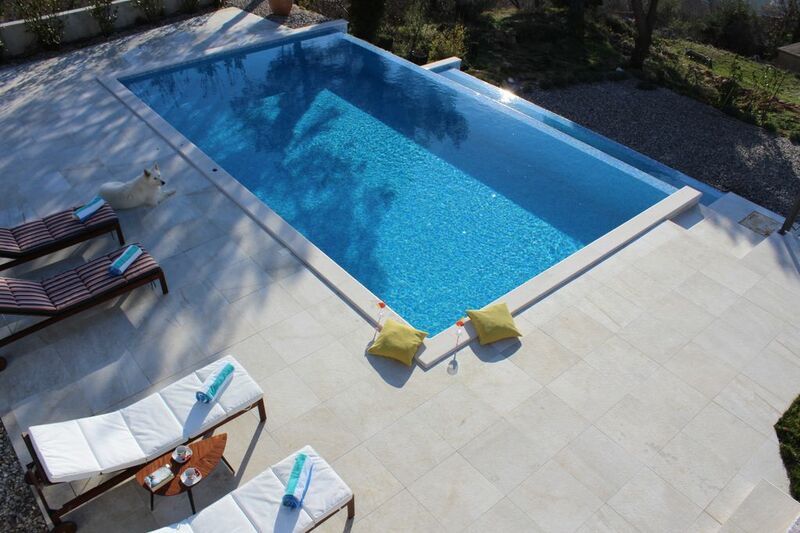 The open-air swimming pool surrounded by beautiful Dalmatian landscape offers a complete pleasure of a summer spell. Villa Yanko also includes a garden that provides relaxing moments for guests. During their walk they can pick fruits and literally enjoy the tastes and scents of nature. Guests can enjoy the olive grove, which we are very proud of, tomatoes and a wide range of herbs. A view of pristine nature of the Makarska Riviera and the Biokovo mountain range provides visual pleasure to the observer. The pool is equipped with automated heating so it can be used during the winter months as well and guests can choose the lighting color of the pool which will give romantic atmosphere to night swimming making it a unique evening experience. Villa Yanko can accommodate up to 8 people. On the ground floor there is a room with bathroom, hallway, kitchen equipped with all the necessary smart kitchen appliances, dining room, living room with large smart tv and long dining table which gives a warm and rustic atmosphere. There is a „Rock Corner“ in the living room with a guitar and two microphones intended for fun with favorite songs that give guests the opportunity to test their singing abilities. The house has a beautiful open gallery overlooking the pool and the sea. On the upper floor there are three rooms with detachable double beds and each room has a flat screen TV, a bathroom with toilet, each with two washbasins, hydromassage shower and a gallery. From each room you can go out to the covered terrace and get to Yanko's gazebo from which guests can watch the stars overnight or the boats that sail into Makarska harbor during the day. The garage includes two parking spaces, and the door is operated automatically. If guests come with more than two cars, we offer 4 parking spaces.